It seems like any new field goes through an inevitable growth spurt that involves “defining the damn thing.” For the first few years of the IA Summit, every second presentation seemed to be about defining what Information Architecture actually is. See also: UX. See also: Content Strategy. Now it seems to be happening with Progressive Web Apps …which is odd, considering the damn thing is defined damn well. I’ve written before about the naming of Progressive Web Apps. On the whole, I think it’s a pretty good term, especially if you’re trying to convince the marketing team. Except, for some reason, that clarity is being lost. Here’s a post by Ben Halpern called What the heck is a “Progressive Web App”? Seriously. I have a really hard time describing what a progressive web app actually is. Those are great descriptions of the benefits of Progressive Web Apps. Perfect material for convincing your clients or your boss. But that appears on developers.google.com …surely it would be more beneficial for that audience to know the technologies that comprise Progressive Web Apps? Google’s continued use of the term “quality” in describing things leaves me with a ton of confusion. It really seems like they want PWA to be a general term that doesn’t imply any particular implementation, and have it be focused around the user experience, but all I see over the web is confusion as to what they mean by these things. My website is already “engaging” and “immersive”, does that mean it’s a PWA? I think it’s important to use the right language for the right audience. If you’re talking to the business people, tell them about the return on investment you get from Progressive Web Apps. If you’re talking to the marketing people, tell them about the experiential benefits of Progressive Web Apps. But if you’re talking to developers, tell them that a Progressive Web App is a website served over HTTPS with a service worker and manifest file. I wrote a while back about switching to HTTPS on Apache 2.4.7 on Ubuntu 14.04 on Digital Ocean. In that post, I pointed to an example .conf file. It turns out that Certbot doesn’t like HTTP and HTTPS configurations being lumped into one .conf file. Instead it expects to see all the port 80 stuff in a domain.com.conf file, and the port 443 stuff in a domain.com-ssl.conf file. So I’ve taken that original .conf file and split it up into two. Hit ctrl and o, press enter in response to the prompt, and then hit ctrl and x. Once again, I hit ctrl and o, press enter in response to the prompt, and then hit ctrl and x. …everything goes according to plan. I’ve got a fairly simple posting interface for my notes. A small textarea, an optional file upload, some checkboxes for syndicating to Twitter and Flickr, and a submit button. It works fine although sometimes the experience of uploading a file isn’t great, especially if I’m on a slow connection out and about. I’ve been meaning to add some kind of Ajax-y progress type thingy for the file upload, but never quite got around to it. To be honest, I thought it would be a pain. But then, in his excellent State Of The Gap hit parade of web technologies, Remy included a simple file upload demo. Turns out that all the goodies that have been added to XMLHttpRequest have made this kind of thing pretty easy (and I’m guessing it’ll be easier still once we have fetch). I’ve made a little script that adds a progress bar to any forms that are POSTing data. Feel free to use it, adapt it, and improve it. It isn’t using any ES6iness so there are some obvious candidates for improvement there. It’s working a treat on my little posting interface. Now I can stare at a slowly-growing progress bar when I’m out and about on a slow connection. Mozilla—like Google before them—have announced their plans for deprecating HTTP in favour of HTTPS. I’m all in favour of moving to HTTPS. 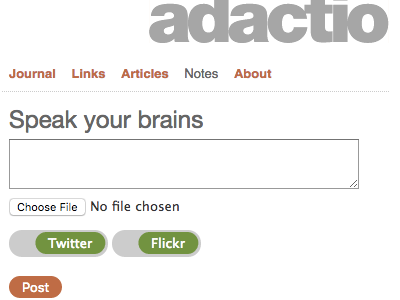 I’ve done it myself here on adactio.com, on thesession.org, and on huffduffer.com. I have some concerns about the potential linkrot involved in the move to TLS everywhere—as outlined by Tim Berners-Lee—but still, anything that makes the work of GCHQ and the NSA more difficult is alright by me. Gradually phasing out access to browser features. Requiring HTTPS for certain browser features makes total sense, given the security implications. Service Workers, for example, are quite correctly only available over HTTPS. Any API that has access to a device sensor—or that could be used for fingerprinting in any way—should only be available over HTTPS. In retrospect, Geolocation should have been HTTPS-only from the beginning. But to deny access to APIs where there are no security concerns, where it is merely a stick to beat people with …that’s just wrong. This is for everyone. Not just those smart enough to figure out how to add HTTPS to their site. And yes, I know, the theory is that is that it’s going to get easier and easier, but so far the steps towards making HTTPS easier are just vapourware. That makes Mozilla’s plan look like something drafted by underwear gnomes. The issue here is timing. Let’s make HTTPS easy first. Then we can start to talk about ways of encouraging adoption. Hopefully we can figure out a way that doesn’t require Mozilla or Google as gatekeepers. Sven Slootweg outlines the problems with Mozilla’s forced SSL. I highly recommend reading Yoav’s post on deprecating HTTP too. Ben Klemens has written about HTTPS: the end of an era …that era being the one in which anyone could make a website without having to ask permission from an app store, a certificate authority, or a browser manufacturer. On the other hand, Eric Mill wrote We’re Deprecating HTTP And It’s Going To Be Okay . It makes for an extremely infuriating read because it outlines all the ways in which HTTPS is a good thing (all of which I agree with) without once addressing the issue at hand—a browser that deliberately cripples its feature set for political reasons. I spent most of today making a Single Page App. The content is loaded into the page using a low-level transport mechanism called HTTP (the great thing about using this protocol is that you get URL routing for free). I bucked the trend and decided not to encode the content in JSON. Instead it’s contained in a text format called HTML. There is some asynchronous loading involved for the rich media; that’s accomplished using a feature of HTML known as the img element. I’m pretty pleased with the results. The whole thing is scrolling smoothly at sixty frames per second. Throughout the Brighton Digital Festival, Lighthouse Arts will be exhibiting a project from Julian Oliver and Danja Vasiliev called Newstweek. If you’re in town for dConstruct—and you should be—you ought to stop by and check it out. It’s a mischievous little hardware hack intended for use in places with public WiFi. If you’ve got a Newstweek device, you can alter the content of web pages like, say, BBC News. Cheeky! I’m all for using https:// instead of http:// but there’s a problem. It’s bloody difficult! If you’re a sysadmin type that lives in the command line, then it’s probably not difficult at all. But for the rest of us mere mortals who just want to publish something on the web, it’s intimidatingly daunting. It’ll cost you <$100/yr plus a half-hour of server reconfiguration. I don’t see any excuse not to. …but then, he also thought that anyone who can’t make a syndication feed that’s well-formed XML is an incompetent fool (whereas I ended up creating an entire service to save people from having to make RSS feeds by hand). if two pages have equal ranking except one is served securely, which do you think should appear first in results? Google will be promoting SSL sites above those without, effectively doing the exact same thing we’re upset about the lack of net neutrality. I don’t think that’s quite fair: if Google were an ISP slowing down http:// requests, that would be extremely worrying, but tweaking its already-opaque search algorithm isn’t quite the same. I think if Google is going to penalize you for not having SSL they should become a CA and issue free certs. I’m more concerned by the discussions at Chrome and Mozilla about flagging up http:// connections as unsafe. While the approach is technically correct, I fear it could have the opposite of its intended effect. With so many sites still served over http://, users would be bombarded with constant messages of unsafe connections. Before long they would develop security blindness in much the same way that we’ve all developed banner-ad blindness. Businesses and individuals who both know about and can afford to have SSL in place will be ranked above those who don’t/can’t. It’s already too damn complex to register a domain and host a website. Adding one more roadblock isn’t going to help that situation. Just ask Drew and Rachel what it’s like trying to just make sure that their customers have a version of PHP from this decade. I want a secure web. I’d really like the web to be https:// only. But until we get there, I really don’t like the thought of the web being divided into the haves and have-nots. There is an enormous opportunity here, as John pointed out on a recent episode of The Web Ahead. Getting TLS set up is a pain point for a lot of people, not just me. Where there’s pain, there’s an opportunity to provide a service that removes the pain. Services like Squarespace are already taking the pain out of setting up a website. I’d like to see somebody provide a TLS valet service. For all of you budding entrepreneurs looking for the next big thing to “disrupt”, please consider making your money not from the gold rush itself, but from providing the shovels.